The Madrid captain missed a penalty against his boyhood club, as the Champions League finalists narrowly lost 3-2 at Sevilla on Wednesday. It was a night to forget for the Spaniard on Wednesday. 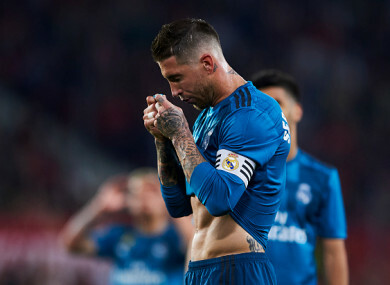 SERGIO RAMOS MISSED a penalty and scored an own goal as Real Madrid were made to rue the absences of key players as they lost 3-2 at Europa League-chasing Sevilla. Zinedine Zidane made seven changes to the side that drew 2-2 against Barcelona in El Clasico last Sunday as injuries, suspensions and a need to rotate saw Cristiano Ronaldo, Gareth Bale, Toni Kroos and Luka Modric sit out, with Sevilla taking full advantage with a little help from their former player Ramos. Although Madrid were afforded plenty of the ball they were not very effective and found themselves trailing 26 minutes in – Wissam Ben Yedder scoring his first LaLiga goal since February with aplomb. Madrid’s response lacked urgency and Sevilla remained the brighter going forward, eventually extending their lead through Miguel Layun’s fine finish right before the interval. Ramos wasted a chance to get the visitors back in it when his penalty come back off the crossbar, and things got even worse for the centre-back – much to the delight of the home fans – when he turned into his own net with six minutes remaining. Substitute Borja Mayoral pulled one back before Ramos converted from the spot at the second attempt deep in second-half stoppage-time, but Sevilla held on for three points that take them into the final Europa League spot, while Zidane’s side remain three adrift of second-place Atletico Madrid. Email “Nightmare for Sergio Ramos as defender misses penalty and scores own goal in Sevilla defeat”. Feedback on “Nightmare for Sergio Ramos as defender misses penalty and scores own goal in Sevilla defeat”.